God heard my silly little notion of starting to do pushups every day. And He laughed long and hard. Right in my face. I went to both hours of karate last night. First class was pretty light - during the warmup we only did 10 pushups, but hey, that's 10 more than I had done all day. 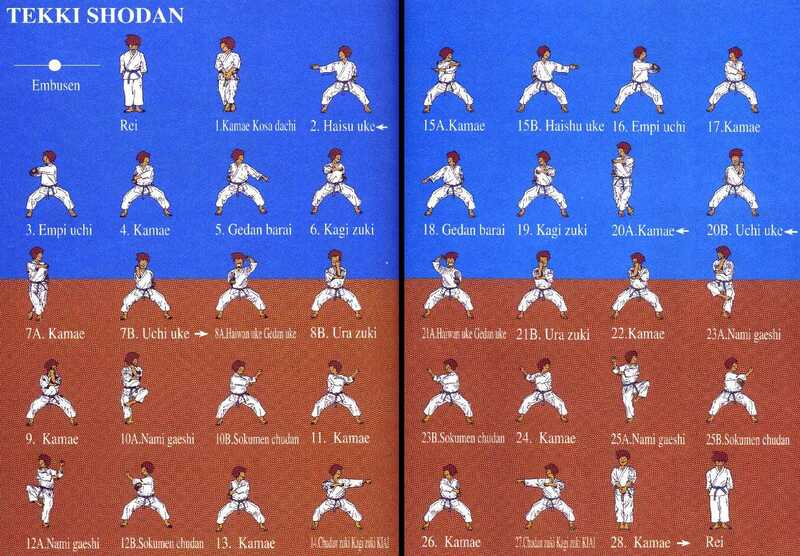 Then the color-belts paired up and we worked on our kicks for a while, then ran kata for a bit. Then I got to work with the white belts who were learning their first kata, Taikyoku Shodan. It was a good class, and I really enjoyed working with the white belts. Then second class starts. One of the newer blackbelts was chosen by Hanshi to start us off with some warmups. Started with a few stretches. And then it happened. "Everybody down - pushup position!" Now as a general rule, when we are going to do pushups during our warmup whoever is in charge of the warmup will just tell us how many to do and to do them on our own. Any time we start pushups without being told a number, and with the warmup leader counting them out for us, that's a red flag for me. Someone must be missing Sensei Charles. And sure enough, after 10 pushups, the dreaded next line was uttered - "everybody over on your back!" Time for crunches. 10 of 'em. Followed by 9 pushups. Followed by 9 crunches. Followed by 8 pushups. Followed by 8 crunches. Followed by 7 pushups. 7 crunches. 6 pushups. 6 crunches. 5 pushups. 5 crunches. 4 pushups. 4 crunches. 3 pushups. 3 crunches. 2 pushups. 2 crunches. 1 pushup. 1 crunch. Pass out. Yep - it was a Big Ten. At least last night we got to stop after the 6 crunches. I don't think I could have made it much farther. But that's, what, 40 pushups? So I did 50 last night! We worked some self-defense second class and I paired up with one of the white belts. I have a newfound respect (not that I didn't already respect them muy mucho) for the upperbelts after last night. Usually, the upperbelts will pair off with the white belts, and being as close as I am to my brown belt testing, I felt it was time to step up to the plate on that one. I had forgotten how little control white belts as a general rule are capable of showing when they are first learning a self-defense move. My sides and armpits are still hurting from this girl's elbows. But she was definitely getting the technique, and that's what's important, right? We did some sanbon kumite, and again I paired up with this same white belt. She had never run sparring drills before, but she caught on quickly. And I got to work on my sidestepping, which is one of my major issues with sparring. So I guess I got to work on both of my goals last night, huh? After the kumite portion of the night, Hanshi broke us up for kata. Blackbelts ran Jion, while Hanchi took the rest of us aside for a "reality check" - we each got the chance to run our kata on our own for him to critique. I have some tweaking to do on a couple of my stances, but other than that, he was pretty pleased with me (and so was I). One of the brown belts was running Tekki Shodan, and he started off wrong - he went left instead of right. Hanshi looks over to me and mouths "is that right?" He thought I should know - he had forgotten I don't know that kata yet! Push-ups are killer for me too. The day after I hurt everywhere including my toes, I swear. Keep it up! I just got my sparring gear today and am trying to entice my husband to spar for a bit tonight. Can't wait to try it out!